Stunning design and acoustics bring out the very best Procella can achieve in this award-winning theater. Electronic House magazine honored the leading Procella dealer with one of its prestigious annual Home of the Year Awards! 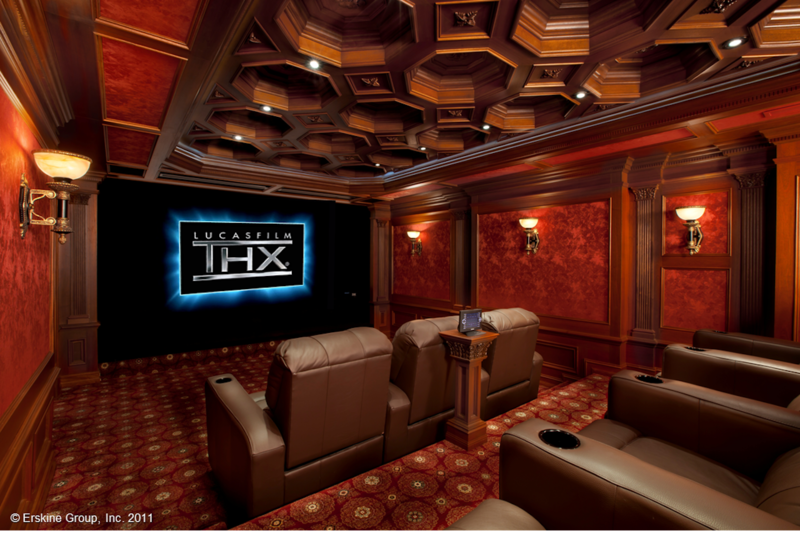 Dennis Erskine and the team at The Erskine Group earned the top category award for Best Home Theater over $150,000. You can see the list of award winners here. In a stunningly beautiful and acoustically optimized environment (check the incredible detail in the ceiling), three Procella P610s are located behind the screen as main speakers, with six P6s for surrounds, plus one P18 main and three P10Si balancing subwoofers. 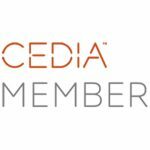 Congratulations to Dennis, Steve, Dave, George, Ricky, Dane and Jim for the industry-wide recognition and for producing yet another amazing theater! A humble building that looks like it should hold tractors is home to a world-class cinema. Some guys consider their garage or shed their man cave, and if they’re lucky they’ve incorporated a TV and sound system for a small level of escape from the main house and daily life. Sure, man cave is a lousy term, but we’ve seen a lot of garage conversions. 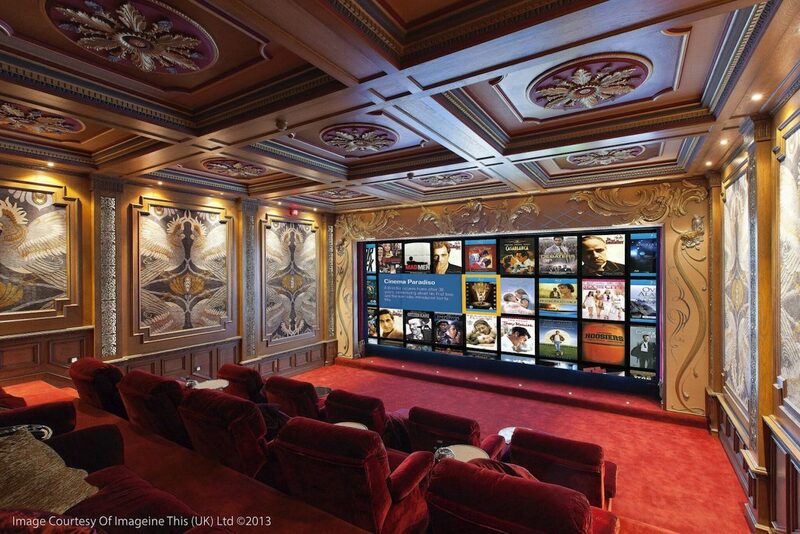 This grand home theater may have started out as an unattached garage, but it’s no mere man cave. 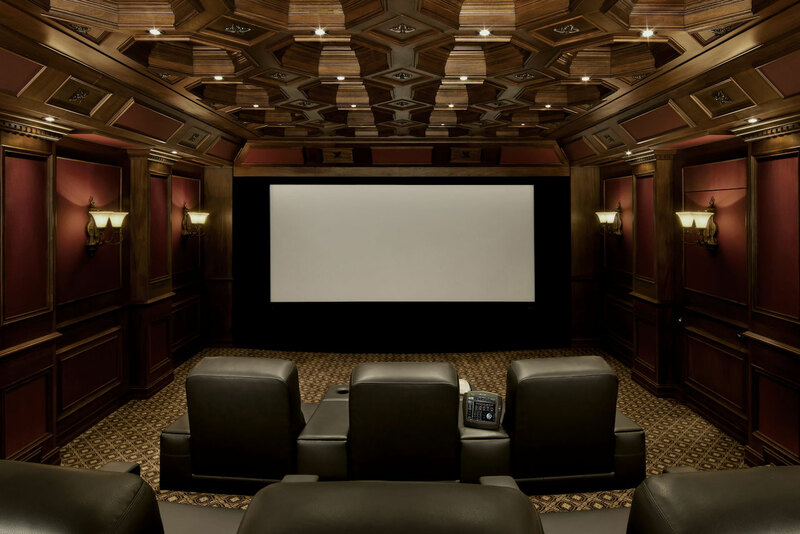 Dennis Erskine, the CEO of Atlanta-based Erskine Group, says the owner of this California home theater has multiple outbuildings on the property, and one in particular, designed for storing farm equipment, was ready for a new life. 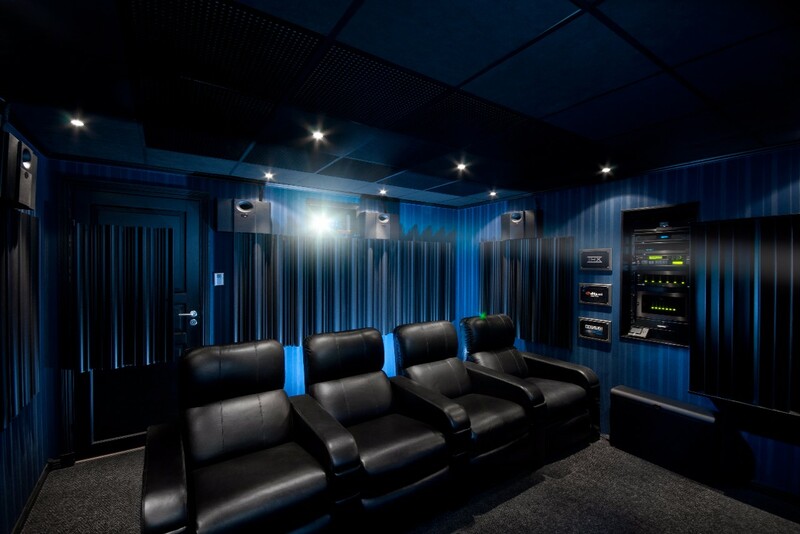 A home theater enthusiast friend suggested the Erskine Group to handle the project and after sharing some concepts and photos of other home theaters, a plan was born—born in a barn, some might say. 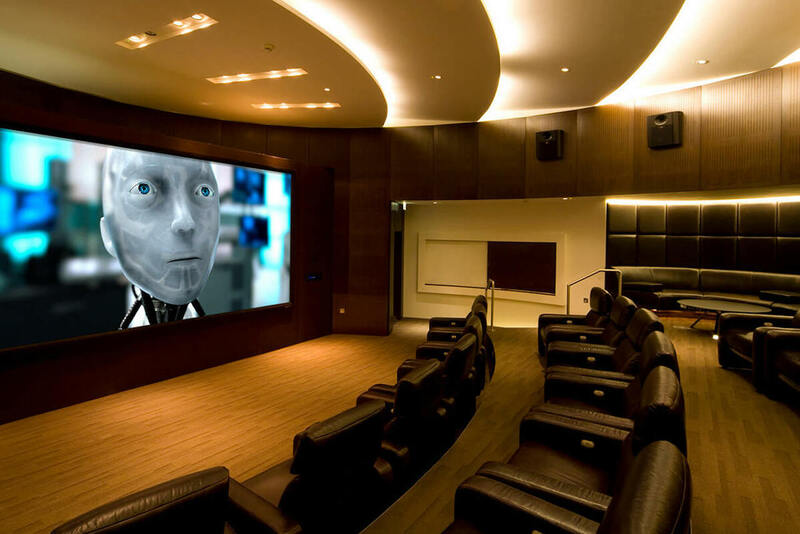 Transforming an ordinary outbuilding into a performance home theater takes a lot more thanjust hanging up a screen and projector. Luckily, Erskine didn’t have to remove much—the building interior was nothing but bare walls, “and not a single wall was square,” he recalls. One of the first things the team did to make the barn a worthy entertainment venue was to install some heavy-duty sound isolation and insulation These materials would prevent noise from a nearby airport from interfering with the surround-sound system. While the exterior of the building still looks pretty much the same, as soon as you open the doors you know you’re in a special place. 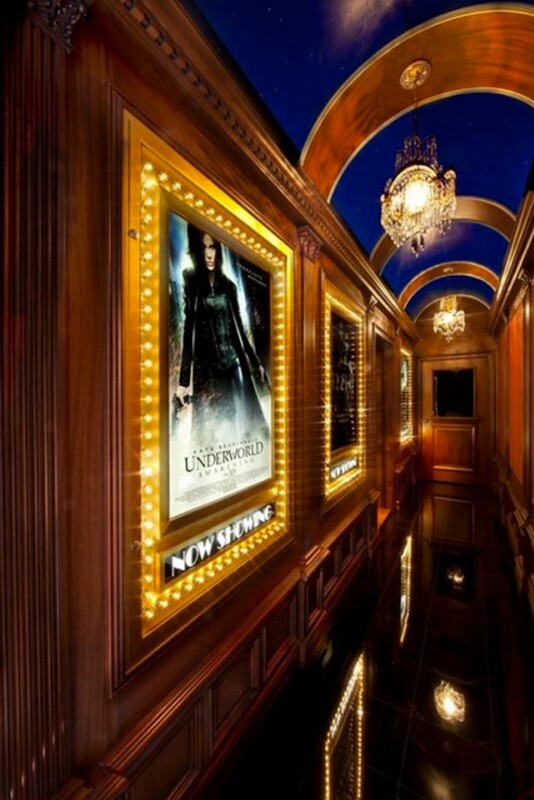 Custom millwork, stars on the ceiling and illuminated movie posters line the hall leading to the main theater, where an expectant hush hangs until the system is powered on. 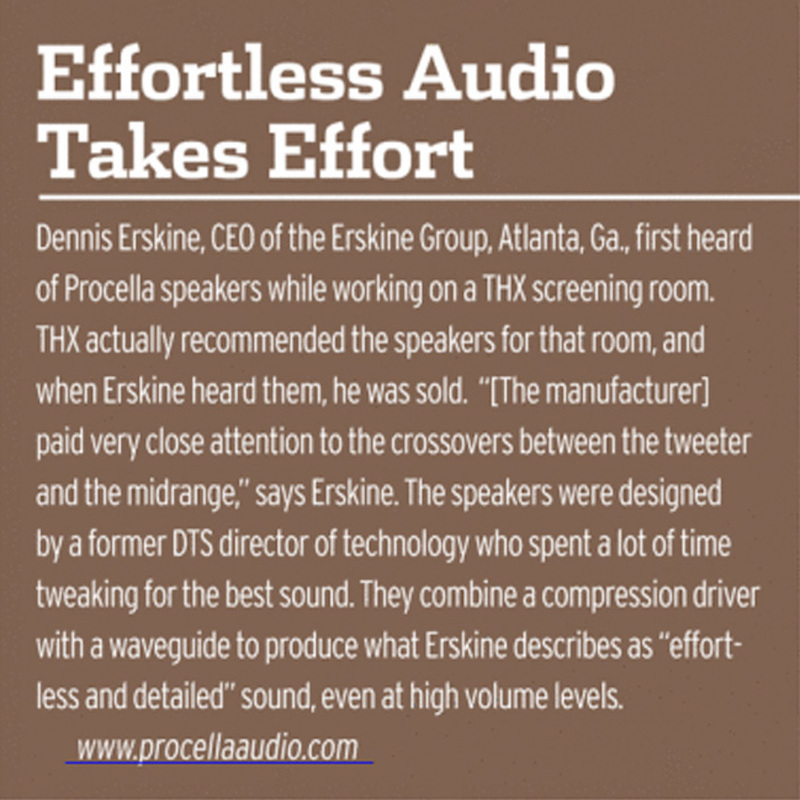 “Noise isolation is something we’re very good at,” says Erskine. The entire interior room was decoupled from the exterior and dampened. Soundproofing Green Glue was added between layers of drywall to enhance the sound isolation. Even the floor is decoupled from the slab. Erskine says the room is so quiet, you can hear your heart beat. 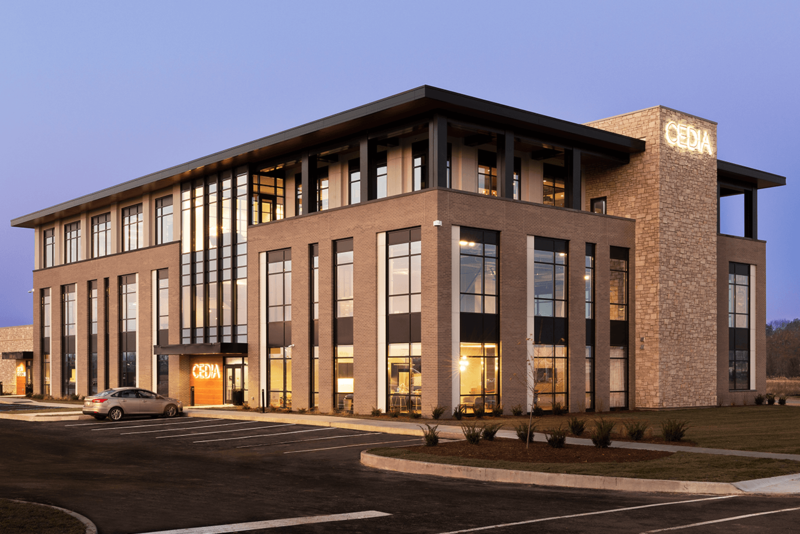 Another priority for this room was the wood—the owner likes custom millwork, and it just so happens that in addition to being electronics professionals, the Erskine Group also does all of its own millwork. The detailed ceiling and custom walls of this room are more than just decorative; they also function as acoustical treatments. The ceiling works as a diffuser, and the walls, which are partially angled downward, help to direct reflected sound into the carpet rather than at the listeners. To make sure that sound isn’t leaking in or out of the room, all of the light fixtures and speakers are coupled to the millwork, not through to the main walls. Sound is provided by a suite of Procella Audio speakers. 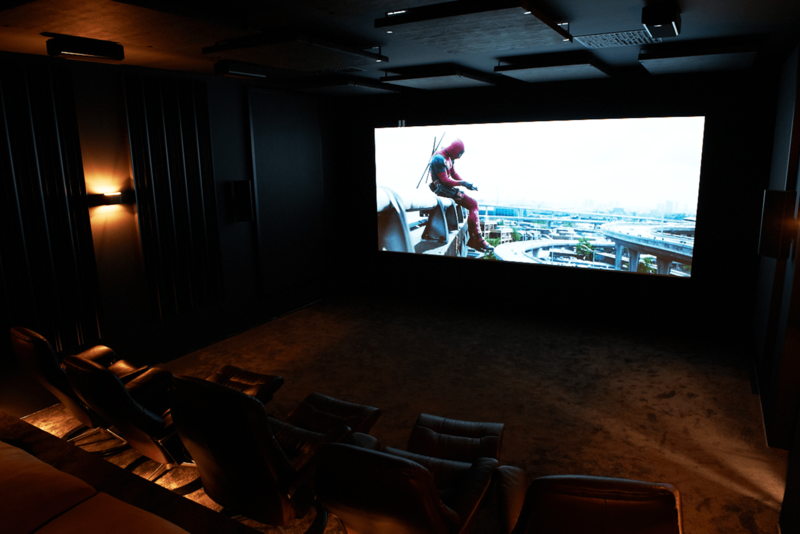 Left, center and right channels are hidden behind the 12-foot-wide Stewart Filmscreen Cinma-Curve screen—a microperforated screen The rest of the room contains five surround-sound speakers and four subwoofers. The speakers are driven by a QSC Audio amplifier and two QSC digital signal processors. Shooting a picture onto that big screen is a 3D Runco SC-50 projector with a Runco AutoScope anamorphic lens system for switching between 2.35:1 and 16:9 video material. A side masking system on the screen adjusts for the picture size in tandem with the anamorphic lens so the screen and the picture always match. Feeding the picture to the projector is a Blu-ray player and a *Kaleidescape movie server. Erskine likes the dual-lamp Runco projector not only because it’s bright enough to light up the huge screen in this huge room, but it actually gets brighter in 3D mode to make up for the light loss caused by the active-shutter 3D glasses. Creating an incredible audio and video experience was one goal of the project, but there was another: to provide a good audio experience for a family member with a hearing impairment. For this person, Erskine installed a special set of headphones in one of the seats. He noted that most audio processors don’t allow both an analog headphone signal and a digital surround-sound signal to run at the same time, so it took some extra work, including a Sony headphone model only sold in Japan, to solve the problem — G.C.